The big political story of the past few weeks is Barack Obama's relations with black <?xml:namespace prefix = st1 ns = "urn:schemas-microsoft-com:office:smarttags" />America. The Washington Post recently published a new poll that showed Hillary Clinton does significantly better with black voters than Obama does. In the past few days, both the New York Times and the Boston Globe have contacted me to find out what Barack Obama was like when we were in law school together. Here's the official story. I attended Harvard Law School for 2 years with Barack. He graduated in 1991. I graduated in 1992. We were not close friends, but we were both well known on campus for entirely different reasons. Barack was something of a celebrity on campus even in law school. That's because he was the first black student elected as president of the prestigious Harvard Law Review. I, on the other hand, was a campus activist, deeply involved in the movement for faculty diversity. The scene at Harvard in the early 1990s was tense and confrontational. Faculty members were divided about appointments and openly warring with one another in the pages of the New York Times and other major newspapers. One of Harvard's first black professors, Derrick Bell, had just taken a leave of absence to protest the school's failure to hire a woman of color on the faculty. At the time, there were very few women or minorities on the faculty, despite the fact that the student population was much more diverse. Along with a few of my classmates, we launched an organization called the Coalition for Civil Rights, which was designed to get Harvard to hire more women and minority professors. Harvard claimed that they could not find qualified women and minority candidates to teach there. That's because they defined the "qualifications" in a way that excluded the work of so many talented lawyers and teachers. In order to be qualified to teach at Harvard, you had to have served on a major law review at a prestigious law school. That was a big hurdle to jump, but when Barack was selected as president of the Harvard Law Review, his election alone made our case for faculty diversity. Although the Washington Post story raises questions about Barack's connection to the black community, I never got the sense that Barack was disconnected from the black community at Harvard Law School. In fact, almost every time I've seen him since law school, it's been because of the black law school connection. A few years back, Barack and I did a joint book event at Harvard put on by a black professor. And the last time I saw Barack was at the Harvard Law School Black Alumni event last fall. As I recall, Barack was always supportive and sympathetic to our campaign for faculty diversity. He spoke about it at one of our rallies. But he was not actively involved in the protest movement. Nor did he need to be. As I said, his presence alone made the case. And even if he agreed with the cause of the movement, he didn't need to be involved in the more radical protests we launched because our tactics were controversial on campus. In my first year at the law school, I became instantly well known when I literally chased the dean of the law school across the campus. Dean Robert Clark was leaving a faculty meeting and completely ignored a student vigil being held outside. When I asked him to talk to us, he ignored me and kept moving. I picked up my backpack and my protest sign and started following him. When he saw me, he literally started sprinting across the campus to get away from me. So I started running after him to catch up. A photographer from the Boston Globe snapped a picture of us that appeared in the paper the next day. That's how I became known on campus. After the vigil, we escalated our protest tactics. We took over the dean's office twice and held sit-ins until the dean would talk to us. We tried to take over the president's office once, but were stopped at the door after the office had been tipped off that we were coming. And when all else failed, we did the one thing we thought Harvard Law School would understand -- we took them to court. Eleven students filed an unprecedented lawsuit against Harvard for discrimination in the selection of the faculty. We argued the case ourselves, all the way up to the Massachusetts Supreme Judicial Court. As I said, those were controversial tactics, and most students on campus were not involved in them. Even the students who supported us didn't always support the methods we chose. Like many of my classmates, I entered Harvard Law School thinking I might be interested in a political career one day. But not every one interested in politics chose the same path to politics. Barack, of course, chose the path of academic distinction on the law review. My classmates, Anthony Brown, elected in November as the second black Lieutenant Governor of Maryland, and Juan Garcia, elected in November to the State House of Representatives in Texas, took a different path. They were both former military men who seemed ready to continue their careers in the service after law school. Meanwhile, my colleagues in the protest movement, were juggling classes, extracurriculars and protesting. Linda Singer, appointed in November as the attorney general of Washington, DC, was one of the three key leaders in the movement, along with myself and John Bonifaz, a MacArthur genius grant recipient who ran for Secretary of State of Massachusetts last year. No one would have guessed that we would all take such different paths and all end up in politics. After graduating in June 1992, I turned down a job working for a big law firm in California so I could work on the Clinton campaign in Arkansas. When Clinton won (my first successful campaign after 10 years of trying), I found myself unexpectedly with a job in the White House. I left that job after a few years to write my first book, and there I ran into Barack Obama again at a joint book signing event put on by Professor Charles Ogletree at Harvard Law School. Barack was there to promote his new book, Dreams From My Father, and I was there to promote my book, One More River to Cross. I never imagined at the time that he would soon become a sitting U.S. senator running a serious campaign for president. 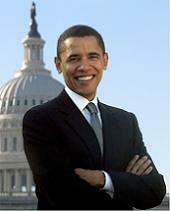 I never imagined that he might be America's first black president. But now when I look back, perhaps I should have seen it. I didn't know Barack always seemed focused and capable. Of all the people I met in law school, it's not surprising that he would be the one to do it first.